If you'd like to know how to use IntelliVision video analytics in your next project, please give us some information in the contact form below and we'll be in touch soon. Very soon. If you would like to become a Channel Partner (integrator or dealer), please go here: Become a Channel Partner. New! 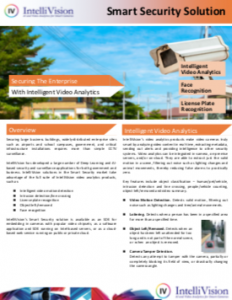 Complete the form below and we'll give you access to our latest white paper: "Securing the Enterprise with Intelligent Video Analytics."